The 'Royal city of the Lotus' is an important provincial capital on the Mun river, in the far east of Thailand not too far away from the border to Laos. The city was founded in the late 18th century by Lao immigrants, with support from the new kingdom of Siam. 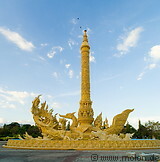 Ubon Ratchathani does not offer too much in term of attractions.